This park is so big and wonderful!! Thanks, Derek. Yes, it's a huge park. And thankfully, almost done! I can't get over the way you blend realistic architecture with fantasy theming and make it all look real. There's lots of inspiration to take from this place. You guys are really too kind. As I've said a thousand times, the only rhyme or reason in this park is........do I like it.....it's a hodge pudge of random to be sure, but at the end of the day, this park is a place I would be a season pass holder. That's the best way to create a park IMO. 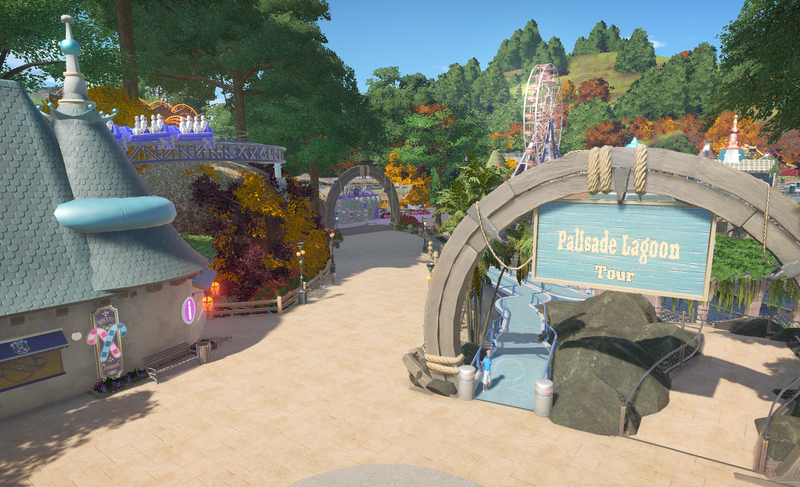 When adding something to your park, all you have to do is ask yourself that question: "Do I like it?" Whether it makes sense in the real world or not is less important. I've always liked the pastel look of the screenshots in this park. You're using an in-game filter? 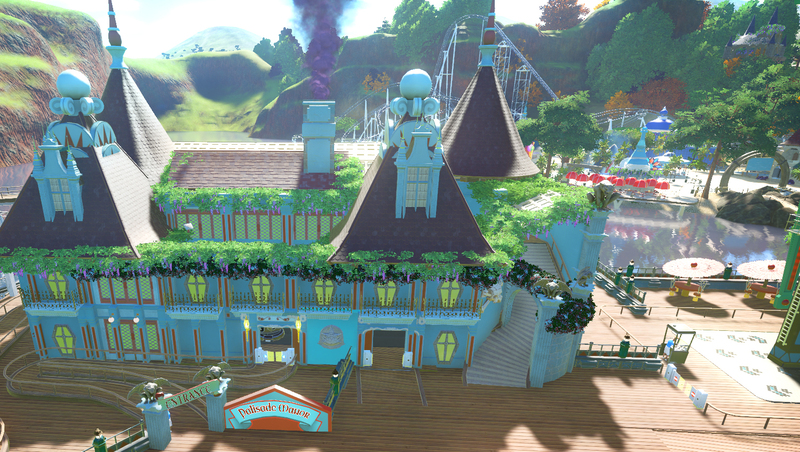 It makes everything look lighthearted and friendly and adds to the fantasy feel of your park. I'm not aware of using an in game filter...hmmm...maybe I am and didn't realize it. Happy New Year! Been tinkering around with this behemoth, trying to get the last part of the pier finished. The lag is awful. Hoping to have it out and done by Feb. 1st. Great to see you continue to plug away at this, despite the lag problem. 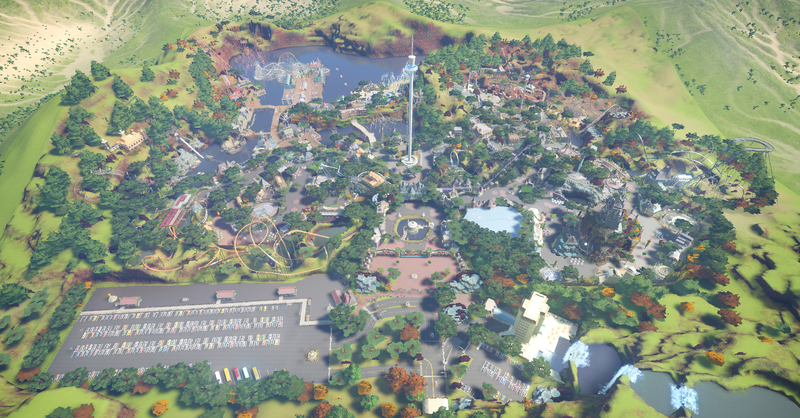 Kudos on being able to build the whole park on one map. 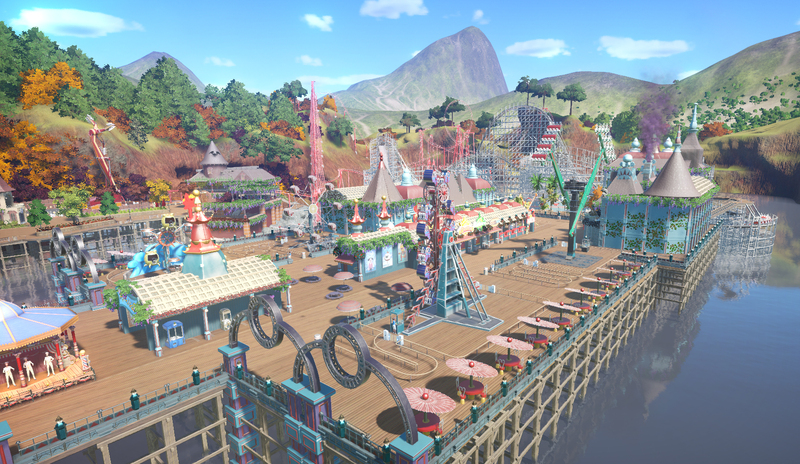 I know I'll soon be forced to chop Wonder World up into bite-sized pieces if Frontier is unable to remedy the lag problem. Oh well. Your shots look great, as always. Looking awesome! I have always liked the feeling of pier amusement parks, even if it is just a theme area. The classic feeling is something that pays tribute to older amusement parks that had really set the standard for theme parks. Amazing screenshots! LuxDreaming, I think the thing I like most about Palisade Park is the consistently whimsical nature of your building style: pink Dumbos pulling sleighs while Ursula the sea witch wraps her tentacles around everything- great stuff. Good-natured fun permeates the entire park. Looks like the horses galloped away from your merry-go-round (gazebo). Maybe they were frightened off by the giant shark head. Your kind words are most appreciated. Many thanks. A few shots of one of two dark rides on the pier, Palisade Manor, a short trip through a haunted house. Cheers! Awesome work on scenery placement and ride creation. Keep up the awesome work! Thx guys.....very kind words........SO!!!!!! 4 ride signs are the last thing to do in this park, and then 18 months of work will be up in the workshop as Palisade Park will be released this weekend! As I have said before....this park suffers greatly from lag....so all the shops are closed, there is NO staff, save for a few mechanics, and the park itself is closed. Any brave souls who want to open this park to peeps will first need to hire staff for all the shops and open them. Also might want to heavily staff the park with the other employees as it is huge! But for now, enjoy the last screens of Palisade Park before its' release. 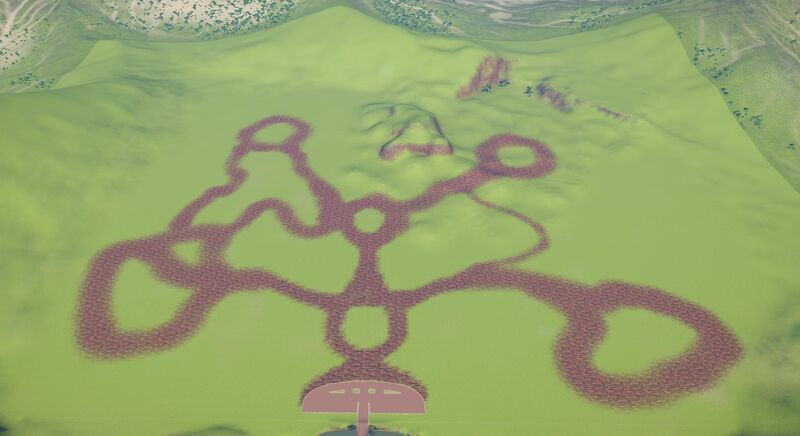 I remember you starting this park by laying out the paths and major rides first, then filling in the gaps. It doesn't seem that long ago, really. It's been a great trip. Thanks for all the inspiration along the way. Welcome to Palisade Park! 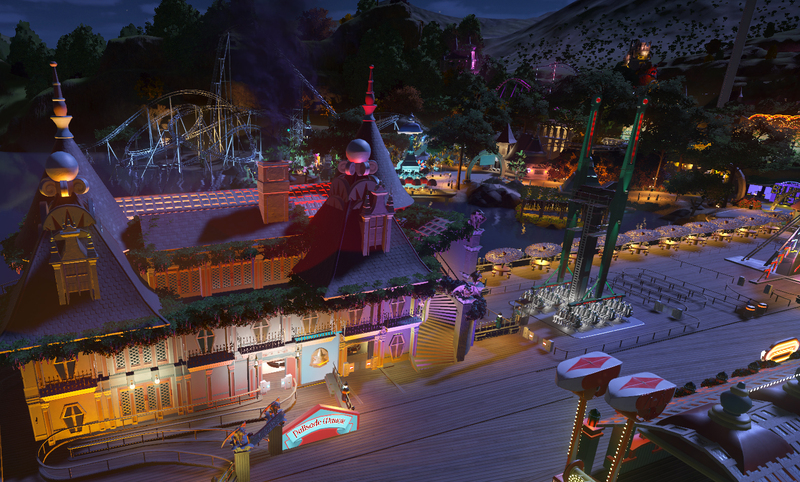 12 Groovy Coasters, 4 fully themed dark rides, and hours of fun await you! WARNING! Due to the enormity of the park and the lag resulting, ALL SHOPS ARE CLOSED! The park is closed and all rides are only in test mode. THERE IS NO STAFF in this park as all the shops are closed, save for a few mechanics. If you decide to open the park to peeps, you will need to hire staff for each shop. Lastly, if you ride Palisade Funhouse, the station roof is set too low, so your head will get cut off. Other than that, I hope you enjoy exploring this labor of love I have been toiling over for 18 months! I am really looking to giving this a serious look! And especially kudos to you for seeing this beauty through to the end! That in itself is a feat! EDIT; So I've tried to open the park three times now, and it crashed my game all three times. Have you given any thought to splitting the park into two halves for those of us who are woefully inadequate in the PC department? I haven't had much chance to look at it yet but it does open for me in a reasonable time and, in its original state, has quite acceptable FPS for moving the camera around. Of course, I had to try opening it as I like to see peeps running around while I'm walking through a park. So first I saved it as a sandbox and reopened it that way. Interestingly, the FPS was considerably worse as a sandbox than as a scenario. Then I started opening shops, without even hiring vendors yet, and that blew things up. Thx BH. 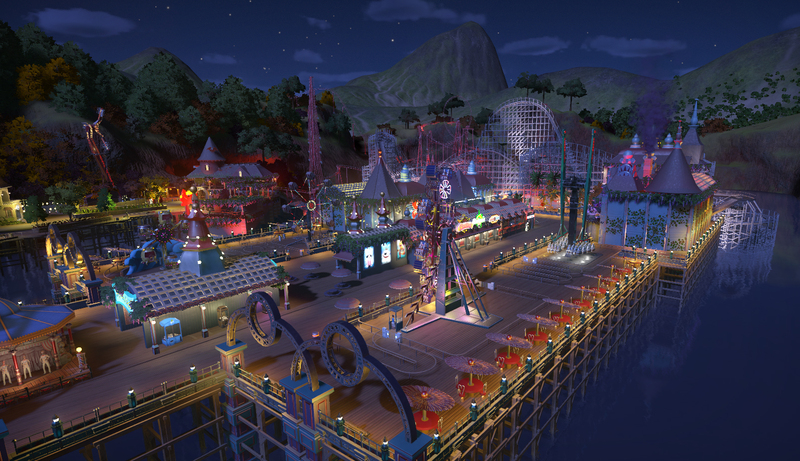 So I set the graphics to Medium, and then I was able to open the shops, hire staff and open the park to peeps and with the park speed set to medium it actually worked quite well..I would say around 16 fps. Haven't heard anyone's thoughts on Palisade Park....likes, dislikes.....can you even open the park. I am thinking I may split the park in half and release it as a front and back section. Maybe that will make it playable. My apologies. I had no problem swinging the camera around with the park closed so I took that as a challenge to open the park. Bad idea. Spent a lot of time trying to make that even work, because I like seeing peeps in the park. So I haven't actually taken a walk-through yet, but I've at least given up on this idea so will just wander the place empty. I hope to report on that soon. I did notice, however, that you've got a collision of buses in the parking lot. Only nit to pick so far. I commented a few posts ago I was unable to open the park. I would love for you to split the park in two! Weird about the busses, as I set them to stationary. That said, I have been exploring the park with peeps, and it seems that whatever was recently updated, has now broken the track rides, namely the sleds and the cars, as they station gates no longer open to let peeps on, just sends out empty cars and then the queue fills up and peeps get pissed off. Anyone else have this happen? Hmmm. The buses were all stationary for me. I didn't open the park, so didn't test the track ride problem. 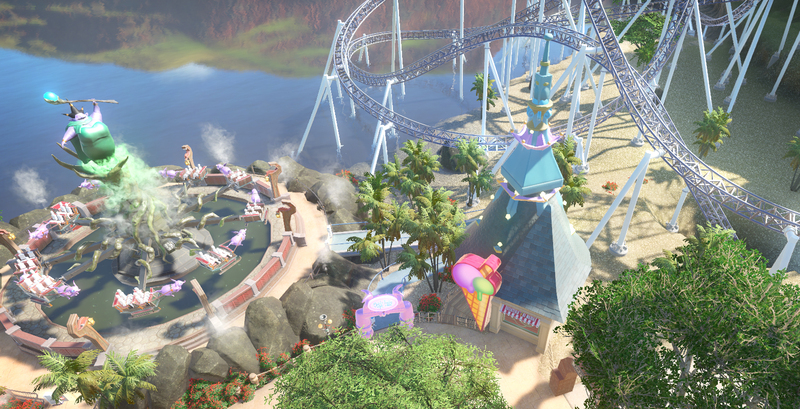 Otherwise, as I've always said, screenshots don't do a park justice. You've got to visit a park first hand to really appreciate all the work and craftsmanship that goes into it. This park is beautiful. I love all the little details and decor, the landscaping and terraforming, the fountains and waterfalls, etc., etc. This was a huge endeavor, and you've created something to be proud of. Great Job! Weird about the busses, as I set them to stationary. The buses aren't moving, but 2 are overlapped.